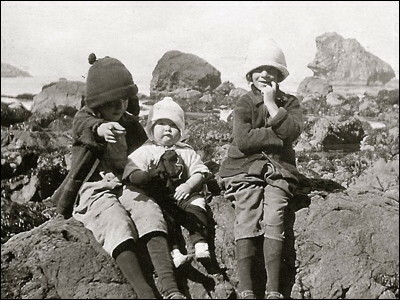 Three Daugherty girls on their first trip to the ocean, August, 1922 near Crescent City. My mother Fredene is in the center. Her sister Carol is on the left (encouraging Mom to look at the camera) and her sister Leona on the right. Youngest sister Betty was born a year later.